As Nevada tries to address overcrowding in its prisons, a team of independent experts shed light on a major driver — inmates are staying behind bars for 20 percent longer on average than they were a decade ago. Analysts with the Crime and Justice Institute, which is partnering with the state to comb through reams of data and help policymakers identify problem areas, gave details on the trend to members of the Advisory Commission on the Administration of Justice (ACAJ) on Wednesday. The longer stays, coupled with a 6 percent increase in overall admissions, are contributing to a prison population that’s 7 percent higher than a decade ago and growing while nationwide state prison rates are dropping. 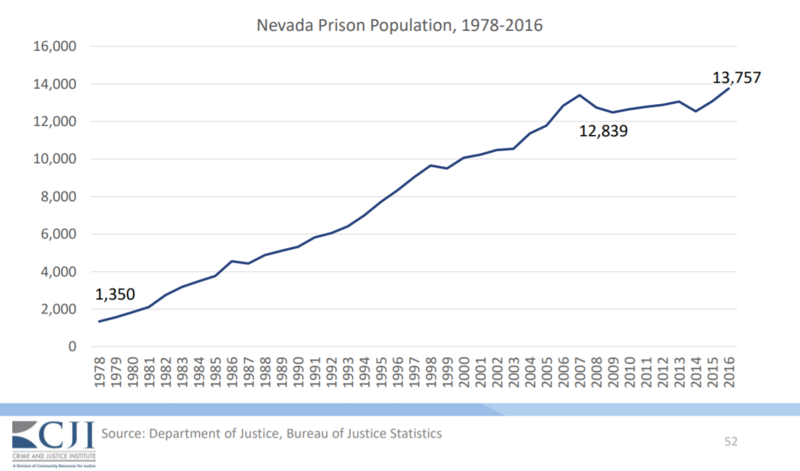 Nevada’s prison population started dipping a decade ago, but has since ticked back up. Graphic courtesy Crime and Justice Institute. Still, the analysts pointed out that there are contributing factors at all levels of the process. Inmates are serving a greater share of their minimum sentence. Inmates released in 2012 had served, on average, 123 percent of the minimum sentence, while the figure had climbed to 129 percent among inmates released in 2017. Minimum and maximum sentences are longer. Analysts found that in those five years, the minimum sentence for property offenses was up 8 percent and the minimum for drug offenses was up 16 percent. The greatest jump in time served was for drug trafficking offenses. Inmates sentenced for that crime — which can involve as little as 4 grams of a Schedule 1 controlled substance — served an average of 32 percent more time in 2017 than people convicted of trafficking offenses and released in 2012. The rate at which inmates were granted parole dropped from fiscal year 2011 to fiscal year 2016. Forty percent of inmates are released from prison simply because their sentence expired, as opposed to being released on parole, in which they are supervised while transitioning back into the community. Prisons director James Dzurenda noted that harsh transition could mean returning inmates are a greater risk to public safety. The commission, which includes law enforcement, Attorney General Adam Laxalt, the American Civil Liberties Union, judges, public defenders and prosecutors, could make recommendations to the Legislature on how to address the trend. At stake is whether Nevada will have to build a new prison or continue sending inmates out of state to a private prison in Arizona because there is not enough space in-state. McNamara pointed out four points in the process where people can be diverted from the criminal justice system. Police have the option of giving someone a ticket rather than arresting them for most misdemeanors, with the exception of DUI and domestic violence. Courts set bail on an inmate early in the process, but the amount of bail required varies widely from county to county in Nevada. Nevada has no statutory requirement to screen inmates for behavioral health issues when they enter a jail, and there’s no standardized response for addressing inmates who do have those conditions. It’s a growing problem in a state that’s seen a 35 percent increase in admissions of inmates with mental illness since 2008. Nevada uses a pre-sentencing assessment that assigns points based on an offender’s crime, criminal history, and other factors that could determine their likelihood of success on parole. But the analysis showed that in about one-third of cases in which an offender was sentenced to prison, the judge diverted from the sentence recommended by the Division of Parole and Probation. Nevada has a broad definition of burglary that entails entering a building with the intent to commit theft or any felony. As a “category B” felony, it carries a potential sentence of 1 to 10 years in prison. 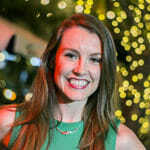 Burglary convictions are the most common property crime admissions into Nevada prisons, but an effort to narrow the statute and make some burglary crimes a less-serious “category C” felony died in the 2017 Legislature without a hearing. While burglary and drug trafficking are “non-person” crimes, McNeil said they’re the kind that “tear communities apart.” He said he and deputies would bear the brunt of backlash if people in his jurisdiction see a burglar who broke into their home or a person who sold their child drugs walking around on the street. Democratic Assemblyman Steve Yeager, chair of the commission, tried to offer some clarity about the exercise. Christopher DeRicco, chairman of the Board of Parole Commissioners, said his agency must constantly weigh the risk that releasing inmates on parole will lead to further crimes, and giving people a second chance, especially if their original crime was related to property and not physically hurting someone.